Stockholm 2015: Swedish lighting brand Örsjö Belysning has launched a range of lamps by designer Joel Karlsson made from spun steel and mouth-blown glass. Gothenburg-based Joel Karlsson's Pebble pendant lights come in either a squat or an elongated bulbous form. 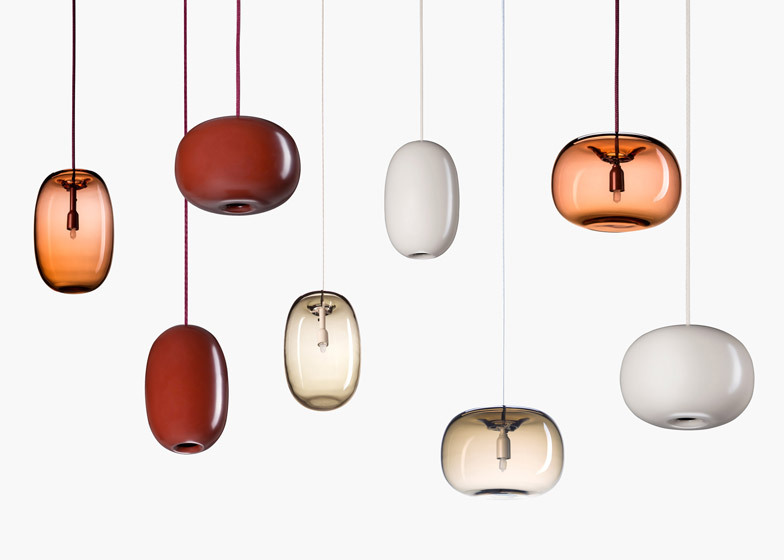 Both shapes are available in a spun-steel fixture with a variety of enamelled finishes, and mouth-blown glass that comes in different colours. "The metal shade version of Pebble gives a pretty steep spot light, so when hanging in groups it needed something to illuminate the steel shade itself," Karlsson told Dezeen. "That is how the glass version came about," the designer said. "This project has been all about materials and surfaces rather than form." The challenge was to replicate identical forms with two very different materials and making processes. "It helped working with such a great producer," said the designer. "Örsjö have their own production of spun steel shades in their factory and the glass was blown by a local glass blower who almost is their neighbour." The light is designed for hotels and restaurants and was launched at the Stockholm Furniture Fair at the beginning of the month. Örsjö Belysning presented the Pebble range, alongside a lamp based on the Stockholm skyline and a domed table light that is dimmed by rotating a wing at its base, at this year's Stockholm Furniture Fair. Other lighting designs that debuted at the event earlier this month include a lamp made of ice that slowly melts back into its mould and a globe-shaped outdoor light for streets and parks.